We went live at the APTA Combined Sections Meeting in New Orleans Louisana. 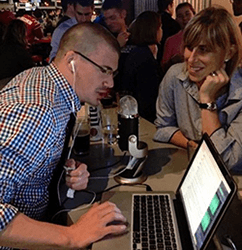 We talked to Kyle Covington of Duke Physical Therapy and Julie Wiebe about her interactions with @Crossfit on twitter. Dr. Covington is a neurologic physical therapist and 2004 graduate of the DPT program. He joined the faculty in 2007. After completing his Ph.D. in Educational Research and Policy Analysis at North Carolina State University, he now serves as the DPT program’s director of assessment and evaluation. Dr. Covington’s experience as a neurologic PT is utilized in the classroom during our foundational examination and neurologic practice management coursework. Dr. Covington’s research interests include professional curricular formation and assessment, collaborative student learning, and professional development of physical therapists. When not trying to change the world one pelvic floor at a time, Julie is happy to focus on her first passions: being a mom to the Z’s (Zoe and Zack), and wife to David. Follow it all on twitter @juliewiebept. Join the conversation with Julie on Facebook. Get your questions answered by Julie and find more content on You Tube.